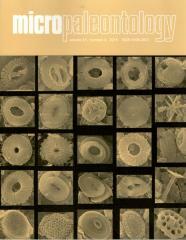 ABSTRACT: Foraminiferal assemblages from a red sediment interval of the uppermost Santonian–middle Campanian Nise Formation, offshore Norway were examined for taxonomy and their paleoenvironmental implications using morphogroup analysis. The relatively highly diversified assemblages are composed only of deep-water agglutinated forms, and in total 61 taxa were identified. The taxonomic and morphogroup composition of the assemblages resemble both the slope flysch-type biofacies in containing robust tubular forms and rzehakinids, and assemblages described from Cretaceous Oceanic Red Beds (CORBs) in the North Atlantic and the Carpathians in the high abundance of infaunal forms in supposedly environments with low flux of organic matter. The intermediate nature of the assemblages in the red sediment interval is probably related to the shallower bathyal depositional settings and higher flux of organic matter due to the proximity to land in a narrow seaway inferred frommorphogroup analysis than abyssal settings of other CORBs. The foraminifera from the red sediment may be regarded as the background deep-water assemblage which reflectswell-oxygenated and low-nutrient environments only with small terrigenous input in the Norwegian Sea which was tectonically active during the Cretaceous.